Open a web browser then go to https://vpn.xavier.edu and login with your Xavier credentials. Click on the "Download Mac 32/64 bit GlobalProtect agent" download link. Double-click on the installation .pkg file that you downloaded. This will launch the setup wizard. Continue through the setup wizard's next prompts, and click Install. You be prompted for your Mac's local account credentials to begin the installation. Enter this information and click Install Software to begin. Click Close to complete the installation when prompted. 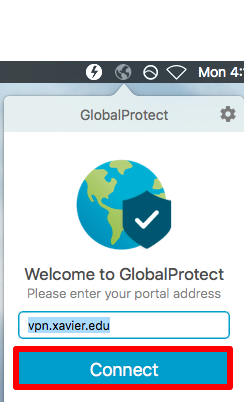 Locate the GlobalProtect icon in the upper-right corner of your screen and click on it. The GlobalProtect window will display. 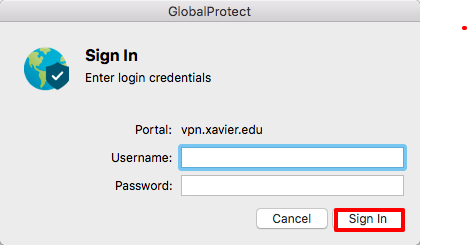 Enter vpn.xavier.edu as the portal address and click Connect. Enter your Xavier credentials when prompted, then click Sign In to connect. 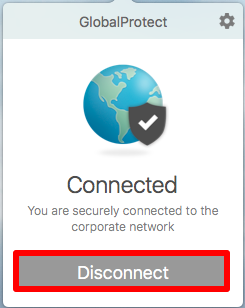 To disconnect, click on the GlobalProtect toolbar icon to display the GlobalProtect window, and click Disconnect.